Boschendal Wine Farm - Stellenbosch Accommodation. Boschendal Accommodation comprises of a number of historical cottages that have been renovated to offer guests an opportunity to experience the Boschendal way of life. With privileged access to the Boschendal Estate, cottage guests are able to enjoy farm life, walk in the vineyards, speed along the mountain biking trails, fish in the dams, read, relax and savour the goodness of life. Rhodes Cottage: This historic cottage, built by renowned architect, Sir Herbert Baker, has been redecorated to give guests a chance to experience a piece of South African history and walk in the footsteps of Cecil John Rhodes. Set under the imposing outline of the Simonsberg mountain, the cottage has magnificent views over the Boschendal Estate and the valley. The cottage is about 2 km from the main Werf. A large verandah, outside dining under the oaks and an eco friendly swimming pool add to the relaxed feel of the property, which is a South African National Heritage Site. Sleeps up to 6 people in the cottage and 4 people in the garden annex. Clarence Cottage is a newly renovated cottage within walking distance of the historic werf where the Boschendal restaurant and Deli are also located. With subtle styling, a generous living area and a big private garden this cottage is an ideal base from which to explore Boschendal and the Cape winelands. The cottage has a large kitchen, fireplace, a porch running the length of the house and sleeps 4 people. The Orchard Cottages is a collection of luxury cottages with kitchenettes, outdoor dining areas for braais, a large shared swimming pool and a magnificent setting among the Boschendal orchards. The cottages are about 2 km from the main werf. A short drive or cycle through the pastures and fruit orchards brings guests to these stylishly converted labourers’ houses. The feeling of the cottages is one of stylish simplicity with a rural yet contemporary character. The atmosphere is carefree and relaxed making the cottages ideal for families or groups of friends. Bring your mountain bike or walking shoes to explore the farm paths, mountain side trails and single track, bring a costume to swim in the pool or farm dams, or simply enjoy the opportunity to sit and read, relax and generally take in the goodness of life. The Werf Cottages: Situated behind and adjacent to the historic werf of Boschendal with ravishing views of the surrounding countryside and mountains, these subtly restored and furnished farm cottages create a virtual village in the Cape-picturesque manner in an idyllic setting. This is the unspoilt Cape as Arthur Elliott photographed it. 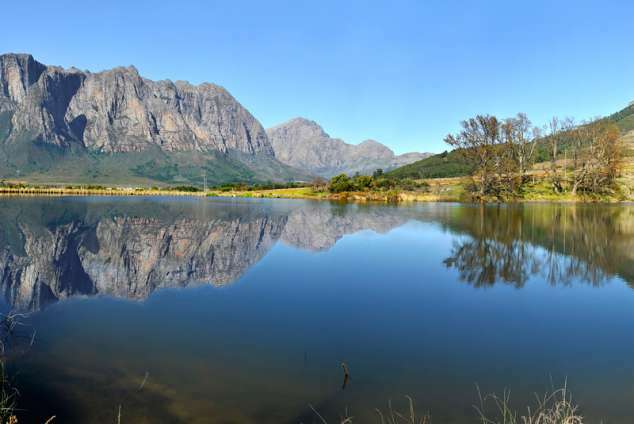 Only an hour’s drive from Cape Town, they are ideal for historic or wineland getaways and romantic weekends. Each cottage has its own fireplace and small kitchen, while the Boschendal restaurant and Deli are within walking distance. The manor house, garden, farm, estate and mountains are all there for you to enjoy. 8593 page views since 09 Jun, 2015.